Gothic romances were flying from the books shelves in the early 1970s. The genre had been around forever, and probably always will be, but it was reaching a definite peak. Why? Well, partly because, at that time, anything to do with the supernatural was big business in movies, TV, paperbacks, magazines, and of course, comics. On the other hand, your garden variety romance comics, which had long been a comicbook staple, were dying out. 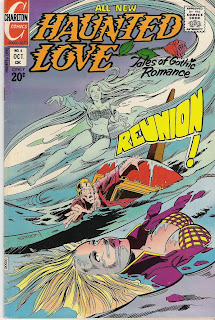 I don't know if the folks at Charlton wanted to try to save the romance genre, or if they were just following the Gothic romance trend when they began publishing Haunted Love in January, 1973. Sadly, the mag didn't last long, running for eleven short issues, the last being published in July, 1975. Now, at the time, I couldn't admit it, but Young Groove really dug Haunted Love. My mom bought the romance comics in the house (dad dug westerns, my sister was into the Harvey and Archie stuff mostly, and I got everything else! ), and when she wasn't looking, and if I was desperate for something new to read (sorry ladies! I was a kid! ), I'd dig through her stash to see if there was anything interesting in there. Occasionally, she'd have a Marvel romance mag and there'd be some Romita, Buscema, or Colan art in 'em. But those Haunted Love mags, with their far-out Tom Sutton or (my fave!) Joe Staton covers were what I was really looking for. I think I read 'em all, but one story stuck with me. I don't know why I flipped for it, but I did, so I thought I'd share it with you! The story in question was written by the always excellent Joe Gill and drawn by Groovy Age Charlton Artist Supreme, Joe Staton. Here it is, from Haunted Love #4 (July, 1973)..."Reunion!" I loved this quirky little title with its blend of genres. Quality-wise it couldn't really compete with DC's Dark Mansion of Forbidden Love. This was Charlton, after all. But they had some good artists and gave this title as much as they were capable of. Any time Joe Staton graced a story it elevated the quality of it. This entry is no exception. His blend of cartoony and dramatic art with his ever innovative layouts really made this story. More Staton Haunted Love, please. And have you ever run any Midnight Tales from Charlton? Those Staton/Howard/Sutton triple treats were great, especially with their comical Wayne Howard covers.